Today we will learn how to read and understand HCG blood test results. Firstly, what is beta HCG test for pregnancy? What is the role of human chorionic gonadotropin HCG? HCG is the hormone directly measure the progression of pregnancy. Chorionic: related to chorion, the part of the women which carry the fetus inside her. Gonado-: means related to reproductive glands and organs. -tropin: proteins specialized or hormones of the protein family. Quant. : stands for “quantitative” means “by numbers or by count. Qual. : means “qualitative”, qualitative test is carried to know whether the hormone found or not, i.e. “Positive or Negative Results”. What is a quantitative HCG blood test? What is the difference between quant. and qual. test? qualitative test carried to tell if pregnancy is positive or negative at the first signs of missed period, while quantitative test is best for following up the course of pregnancy and viability of the pregnancy. Women ask for what does IU/l or miu/ml means in pregnancy test? Iu/l means how much units of pregnancy hormone are found in each liter of your blood, similarly the miu/ml is the smaller unit of iu/l, which “m” means “micro”, “iu” means “international unit or just unit”, “L” means “liter”, “ml” means milliliter”, and “ng” means “nanogram”. 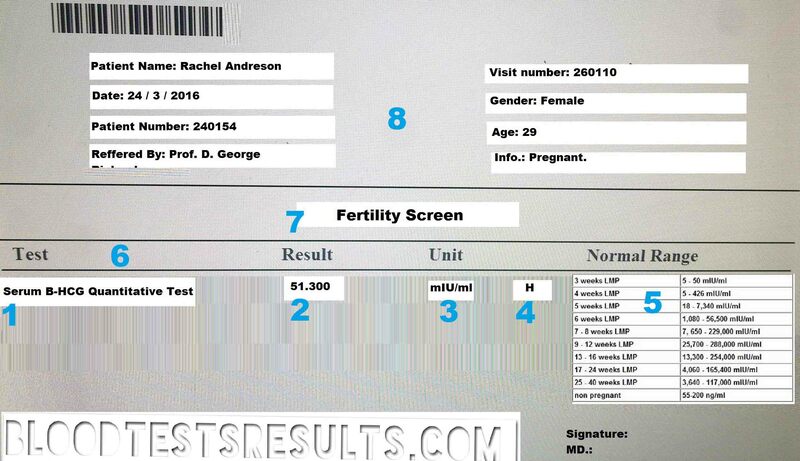 2- Result: is the spot show your current tested count of b-hcg hormone. 4- Flags spot: H means High, L means Low, hcg lab report rarely show H & L Flags. 5- Reference ranges: Normal values ranges for the specific period of pregnancy episode, e.g. the range from 7 weeks LMP to 8 week LMP is from about 7000 iu/l and up to 229000 iu/ml, the first value is the lowest expected normal level of BHCG during 7-8 weeks LMP, and the second value is the highest expected normal level of hcg hormone during 7-8 weeks of normal pregnancy. 8- The information header and logo header. How to read B-HCG blood test levels chart or table? HCG blood test chart is a table show you what are normal hcg levels corresponding to your date of pregnancy. The column on the left represents the period of gestation by weeks post last menstrual period, sometimes reported in the days past ovulation “DPO”. The column on the right usually contains the expected normal counts of HCG hormone for each period. In the reference ranges part: the first number show means the lowest expected hcg value, the second number show the highest expected hcg value, both values are the expected range for the corresponding period of gestation “in weeks or DPO”. When you start searching for your hcg right level: calculate the right age of gestation, start with the left column and choose the right week or DPO you’re currently in, the corresponding values are the normal seen values for your period of pregnancy, if you find your hcg value is higher than the expected values in the chart, please do not be scarred of molar pregnancy or hurry to expect twins, low hcg level than the expected values in the chart is usually an inevitable or unstable pregnancy. How to understand HCG levels chart for twins? If you want more explanation of your hcg blood test level, comment with your values and information, or send me a private message. the meaning of hcg blood test results and how to understand your hCG test levels? My LMP is Oct 6th. My FET (frozen embryo transfer) is Oct 23rd of one embryo of 3 days. Do you think it is possible that I succeed in avoiding a non viable pregnancy (miscarriage) or an ectopic pregnancy ?